HELSINKI: Nokia Corp is suing Apple Inc in the United States for allegedly infringing patents in its mobile phones, portable music players, Tablets and computers. The complaint, filed with United States International Trade Commission, ITC, is the latest in a string of lawsuits by Nokia of Finland and comes as the world's largest handset maker struggles to keep up with smartphone rivals such as Apple. Apple and Nokia have been locked in a long-running legal battle over patent claims, with each side accusing the other of infringing on patents that cover features such as swiping gestures on touchscreens and the built-in "app store" for downloading updated programs. The major phone makers - including Apple, Nokia, Microsoft, Motorola and Taiwan's HTC - are increasingly turning to patent litigation as they jockey for any edge to expand their share of the rapidly growing smartphone market. Companies such as Nokia are also seeking to protect their business as the popular iPhone encroaches on the rest of the industry. The lawsuits cover all aspects of basic phone use, from technology used to synchronise e-mail, calendars and contacts, to methods to extend battery life. Although these legal disputes generally don't stop products from reaching consumers, litigation can be used to extract licensing fees from competitors. It can also help distract rivals and even discourage them from entering a particular market. Nokia said the seven patents in the new complaint relate to its "pioneering innovations" that Apple allegedly is using "to create key features in its products, including in multitasking operating systems, data synchronisation, positioning, call quality and the use of Bluetooth accessories." Last week, the United States International Trade Commission found no violation in an earlier complaint. Nokia said it "is waiting to see the full details of the ruling before deciding on the next steps in that case." Last year, Nokia also sued Apple in Britain, Germany and the Netherlands for allegedly infringing its patents with technology used in the iPhone, iPad and iPod touch. Those followed earlier lawsuits by Nokia claiming that a broad swath of Apple products violate its patents. 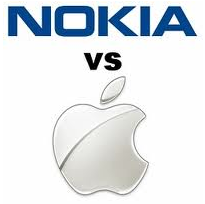 Apple had earlier responded with its own infringement claims against Nokia. "Our latest ITC filing means we now have 46 Nokia patents in suit against Apple, many filed more than 10 years before Apple made its first iPhone," said Paul Melin, vice-president of intellectual property at Nokia. "Nokia is a leading innovator in technologies needed to build great mobile products and Apple must stop building its products using Nokia's proprietary innovation." The legal disputes come amid increasing competition in the fast-growing smartphone market. Tech companies are scrambling to win over the growing number of consumers buying handsets that come with e-mail, websurfing and scores of apps for checking the weather, updating Facebook and other tasks. Nokia has been struggling against stiff competition, especially from the iPhone and Research in Motion's BlackBerry. Nokia said that during the past two decades it has invested some 43bil euro in research and development to build "one of the wireless industry's strongest and broadest IPR portfolios," which includes more than 10,000 patent families. In addition to the two ITC complaints, Nokia said it has filed cases on the same patents and others in Delaware, and has further cases proceeding in Mannheim, Dusseldorf and the Federal Patent Court in Germany, the British High Court in London and the District Court of the Hague in the Netherlands.